Dog bites are a serious problem here and across the country. Sadly, the victims are most often children. However, we can prevent dog bites by better educating owners, parents, children and the public. Start here with this month's newsletter. Click on the CHILD ABDUCTION link above and watch. The video speaks for itself. Kids love dogs. But kids also suffer the most dog bites. Learn more here. The old saying “dogs are a man’s best friend” might be news to the more than four million people bitten each year, most often children and the elderly. Some of these attacks result in emergency room injuries, reconstructive surgery and – for 39 people in 2013 – death. Of course, no one is disputing the deep companionship and loyalty dogs provide to millions of Americans. But safety advocates and dog experts say more can be done to prevent dog bites. 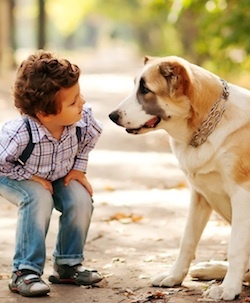 You should know how you or your children can avoid dog bites, your responsibilities as a dog owner and your rights if you or someone close has suffered a dog bite injury. More than 46 percent of U.S. households provide homes to approximately 77.8 million dogs, according to a 2015-2016 survey by the American Pet Products Association. Dog owners spend an average of $1,641 a year on care, food, boarding and toys. Each year there are 4.5 million dog bite incidents in the United States, 885,000 of those serious enough to require medical attention. Children are the most common victims of dog bites, followed by the elderly. Last year, 5,767 postal carriers were bitten by dogs in the United States. To call attention to this issue, the U.S. Postal Service launched National Dog Bite Prevention Week, which will take place this year from May 16 to 22. Victoria Stilwell, host of Animal Planet’s It’s Me or the Dog, demonstrates how to avoid a dog attack by reading a dog’s body language and what to do if you are attacked. Could Your Dog Cost You Your Home Insurance? Some insurance companies are denying homeowners insurance to people with dogs categorized as a “dangerous breed.” CNN’s New Day interviewed dog owners and insurers. View video. Professional dog trainer and former law enforcement officer Hector Hernandez demonstrates advanced tactics for utility workers, postal carriers and others in preventing and responding to dog attacks. View video. Laws have been passed across the country targeting breeds deemed naturally aggressive. Dr. Emily Patterson-Kane takes on this hot topic.